1969 was a great year for Cadillac sales (and 1970 was better still), so it's no surprise that we're now looking at the third '69 Cadillac in this series. That's as good a reason as any to have a poll to determine the readers' favorite street-parked Alameda Cad on this fine Friday morning. I found this '69 parked just down the street from the Checker Marathon, and it has the look of a low-mileage original-owner car: solid, some rough spots but overall pretty nice. This may well be one of those old cars that only rarely ventures off the island. High sales figures or not, at $5,924 the '69 Sedan de Ville wasn't cheap. In fact, for just $3,776 the big-car buyer could pick up a '69 Impala sedan with the 425-horse 427 and 4-speed manual transmission. So let's say it's 1969, you're an up-and-coming strip-club owner in Dallas, and you're car shopping. Do you get the Cadillac with 375 horsepower or the cheaper Impala with 425 horsepower and a 4-speed? Which one will most impress your wide-lapel-wearing, cigar-chewing peers? Such tough decisions we face! This car appears to have the original paint, which shows some- but not all- of its 39 years. 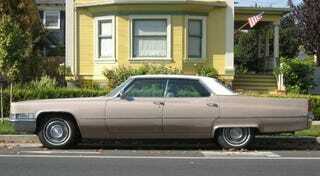 I've driven a few Cadillacs of this era, and they really do move pretty well in spite of their vast bulk. At 4,660 pounds, however, the '69 Sedan de Ville is a lightweight next to most of the SUVs used for edge-city commutes these days. In fact, this car scales in at just 1,000 pounds heavier than a 2008 Mustang; about the weight difference between the 1978 and 2008 Honda Civics.